During the Second World War Ian Donald had become interested in the potential of radar and sonar in medical diagnostics, and the industrial firms in Glasgow offered the opportunity to explore his ideas further. "the innumerable difficulties, set-backs and disappointments have been more than compensated for by those who have turned the subject from a laughable eccentricity into a science of increasing exactitude." He began working with a local electronics company to experiment with the use of industrial sonar with pregnant women and with T.G.Brown from Kelvin and Hughes Ltd produced the first successful diagnostic ultrasound machine. The results were reported, with co-author Dr John MacVicar, in the Lancet of June 7th 1958. The early days of ultrasound were not easy; colleagues were sceptical and he struggled with the early machines, but eventually produced equipment that was able to display a clear image of the fetus in the uterus. From the early equipment, a new science of fetal diagnostics has emerged, with machines that today show the unborn fetus in increasingly sharp detail. Ultrasound is now used in many fields of medical diagnostics beyond obstetrics and thus in a number of specialties Donald’s invention has changed the face of medical practice. Born 27 December 1910, Liskeard, England. 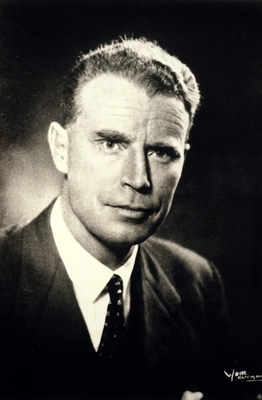 Ian Donald (1910-1987), the developer of the use of ultrasound in the field of obstetrics, was Regius Professor of Obstetrics and Gynaecology from 1954 to 1976. He was awarded an honorary DSc in 1983. Born in Cornwall, Donald was educated at schools in Scotland and South Africa and studied Medicine at London University. He served as a Medical Officer in the Royal Air Force during the Second World War, when he was mentioned in dispatches and awarded (in 1946) an MBE for bravery. In 1951 he was appointed Reader in Obstetrics and Gynaecology at St Thomas Medical School, London, where he devised a respirator for new-born babies with respiratory problems. Donald became interested during the Second World War in the possibilities of adapting radar and sonar technology for medical diagnosis. He worked with T G Brown of the the scientific instrument makers Kelvin & Hughes to create the first diagnostic ultrasound machine, and in 1958, with Brown and John MacVicar, he published his findings in The Lancet. He was involved in the planning and design of the Queen Mother's Hospital in Glasgow, which opened in 1964 and was appointed CBE in 1973. Donald, Ian, J. MacVicar and T. G. Brown. 1958. Investigation of abdominal masses by pulsed ultrasound. Lancet. 1:7032:1188-95. The first successful diagnostic ultrasound machine was reported in the Lancet by Ian Donald and John MacVicar, in one of the most important papers ever published in the field of diagnostic medical imaging. World Changing Project, "Pioneering the use of ultrasound in medicine," in University of Glasgow World Changing (University of Glasgow, 2010); http://www.worldchanging.glasgow.ac.uk/article/?id=43 (accessed April 25, 2019). World Changing Project. "Pioneering the use of ultrasound in medicine." In University of Glasgow World Changing. University of Glasgow, 2010. http://www.worldchanging.glasgow.ac.uk/article/?id=43 (accessed April 25, 2019). World Changing Project. "Pioneering the use of ultrasound in medicine." University of Glasgow World Changing. University of Glasgow, 2010. 25 April 2019 <http://www.worldchanging.glasgow.ac.uk/article/?id=43>.